A very distant galaxy, CR7, discovered using ESO's Very Large Telescope is by far the brightest galaxy yet found in the early Universe, and there is strong evidence that examples of the first generation of stars lurk within it. These massive, brilliant, and previously purely theoretical objects were the creators of the first heavy elements in history — the elements necessary to forge the stars around us today, the planets that orbit them, and life as we know it. This newly found galaxy is three times brighter than the brightest distant galaxy known up to now. Astronomers have long theorized the existence of a first generation of stars — known as Population III stars — that were born out of the primordial material from the Big Bang. All the heavier chemical elements — such as oxygen, nitrogen, carbon and iron, which are essential to life — were forged in the bellies of stars. This means that the first stars must have formed out of the only elements to exist prior to stars: hydrogen, helium and trace amounts of lithium. These Population III stars would have been enormous — several hundred or even a thousand times more massive than the Sun — blazing hot, and transient — exploding as supernovae after only about two million years. But until now the search for physical proof of their existence had been inconclusive. Finding these stars is very difficult: they would have been extremely short-lived, and would have shone at a time when the Universe was largely opaque to their light. Previous findings include: Nagao, et al., 2008 , where no ionised helium was detected; De Breuck et al., 2000, where ionised helium was detected, but alongside carbon and oxygen, as well as clear signatures of an active galactic nucleus; and Cassata et al., 2013, where ionised helium was detected, but of a very low equivalent width, or weak intensity, and alongside carbon and oxygen. A team led by David Sobral, from the Institute of Astrophysics and Space Sciences, the Faculty of Sciences of the University of Lisbon in Portugal, and Leiden Observatory in the Netherlands, has now used ESO's Very Large Telescope (VLT) to peer back into the ancient Universe, to a period known as reionisation, approximately 800 million years after the Big Bang. Instead of conducting a narrow and deep study of a small area of the sky, they broadened their scope to produce the widest survey of very distant galaxies ever attempted. Their expansive study was made using the VLT with help from the W. M. Keck Observatory and the Subaru Telescope as well as the NASA/ESA Hubble Space Telescope. The team discovered — and confirmed — a number of surprisingly bright very young galaxies. One of these, labelled CR7, was an exceptionally rare object, by far the brightest galaxy ever observed at this stage in the Universe. The artist's impression above shows CR7 using ESO's Very Large Telescope. CR7's nickname is an abbreviation of COSMOS Redshift 7, a measure of its place in terms of cosmic time. The higher the redshift, the more distant the galaxy and the further back in the history of the Universe it is seen. A1689-zD1 , one of the oldest galaxies ever observed, for example, has a redshift of 7.5. The X-shooter and SINFONI instruments on the VLT found strong ionised helium emission in CR7 but — crucially and surprisingly — no sign of any heavier elements in a bright pocket in the galaxy. 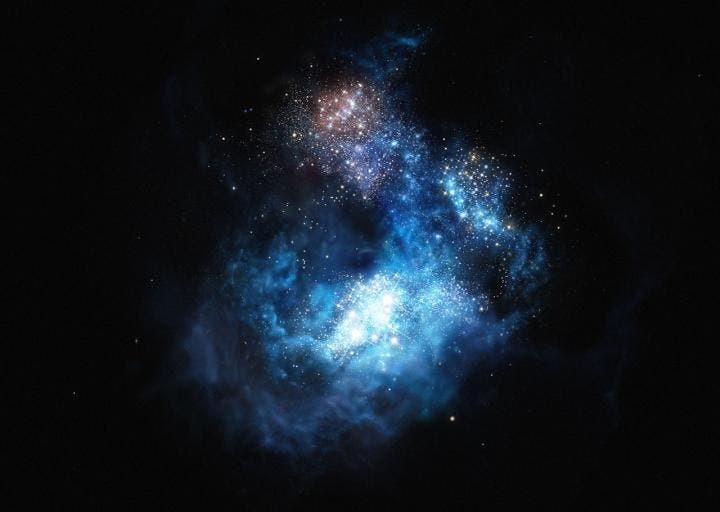 This meant the team had discovered the first good evidence for clusters of Population III stars that had ionised gas within a galaxy in the early Universe. The team considered two alternate theories: that the source of the light was either from an AGN or Wolf-Rayet stars. The lack of heavy elements, and other evidence strongly refutes both these theories. The team also considered that the source may be a direct-collapse black hole, which are themselves exceptional exotic and purely theoretical objects. The lack of a broad emission line and the fact that the hydrogen and helium luminosities were much greater than what has been predicted for such a black hole indicate that this, too, is unlikely. A lack of X-ray emissions would further refute this possibility, but additional observations are needed. "The discovery challenged our expectations from the start,"said David Sobral, "as we didn't expect to find such a bright galaxy. Then, by unveiling the nature of CR7 piece by piece, we understood that not only had we found by far the most luminous distant galaxy, but also started to realise that it had every single characteristic expected of Population III stars. Those stars were the ones that formed the first heavy atoms that ultimately allowed us to be here. It doesn't really get any more exciting than this." Within CR7, bluer and somewhat redder clusters of stars were found, indicating that the formation of Population III stars had occurred in waves — as had been predicted. What the team directly observed was the last wave of Population III stars, suggesting that such stars should be easier to find than previously thought: they reside amongst regular stars, in brighter galaxies, not just in the earliest, smallest, and dimmest galaxies, which are so faint as to be extremely difficult to study. CR7 is three times brighter than the previous titleholder, Himiko, which was thought to be one of a kind.